Warnings: None really, just spoilers for season 13. Author’s Note: Not my characters, only my story. Written for the 2018 spncanonbigbang. Story inspired by a post on tumblr about Dean’s hatbox in 13.06. A lot of the Western slang and lingo comes from here. Thanks to my beta, crazyladyinvegas for the great suggestions. 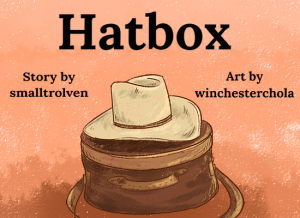 Dean’s started using an old leather hat box he found in the Bunker to carry his Western gear. Unfortunately for him it really should have been in the room of cursed and clearly labeled objects and not in what the brothers jokingly call the junk room.